Bring your car to a local, family-owned auto shop that treats you and your car with special care. 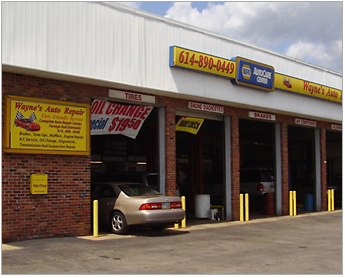 Since 1999, our auto repair shop in Westerville, OH, has provided high-quality car repairs without charging high prices. Avoid the dealer and come to us for vehicle services. At Wayne's Auto Repair, we service and repair all makes and models. Most importantly, we provide comprehensive auto repair, and we even fix transmissions. As a skilled ASE-certified auto mechanic, we have more than 30 years of experience in the industry. That means you can trust us to get you back on the road no matter what the problem is with your vehicle. In addition, our business is A accredited with Better Business Bureau®, which means you can always trust us for reliable auto repairs. Without a fully functioning car, you're not going anywhere. Depend on a highly experienced mechanic that provides comprehensive and quality repairs. Whether you need new brake pads, an oil change, or engine repair, the team at our car repair shop is equipped to handle the issue. Car troubles can be the start of a frustrating process. Whether your vehicle breaks down on the way to work or while you’re out running errands, nobody likes dealing with a vehicle that won’t work. We understand how stressful this type of situation can be, which is why you can rely on us to help you find a solution as quickly as possible, all while delivering friendly and courteous service. The first thing we do is run a complete a diagnostic on your vehicle. Using the latest technology, we’re able to pinpoint where the source of the problem is coming from and how to best treat it. We understand that time is of the essence. Life without a vehicle makes scheduling outings with friends, errands, and other daily tasks difficult. We find the problem with your vehicle and repair it quickly, so that you can get back to your normal routine. As reliable auto mechanics, you can depend on us for complete and wide-ranging service. Trusting your vehicle to an inexperienced mechanic could prove to be costly. Without the proper training and experience, your automobile could be misdiagnosed or the problem could be missed completely. You don’t have to worry about that when you bring your vehicle to us because our mechanics are meticulous with their work. We inspect every part of your vehicle and give it a thorough checkup to ensure no details are missed. Building a relationship with the members of our local community is important to us. Your vehicle is an expensive and necessary investment. Without it, it’s likely to make getting around town much harder. That’s why we take great pride in forming bonds with our customers that last a lifetime. When you come to our repair shop, you can rest assured that your vehicle is in capable and experienced hands. We’re not in the business of price gauging. We’re always looking out for what’s in the best interests of our customers. While we can’t control the damage your vehicle has already sustained, we can control how we choose to repair it. You can always trust our mechanics to approach the repairs your vehicle needs with your wallet in mind. We never suggest repairs unless they’re absolutely needed and when we do, we don’t do perform any work until you’ve given us your approval to do so. Count on us to ensure your vehicle runs and operates smoothly after we work on it. We want you to have a positive experience when you visit us. From the moment you walk in the door to the time you drive off our property in a fully repaired car, we ensure you are completely satisfied with us. In fact, you'll never need to endure subpar service at our car repair shop. That's because we go out of our way to ensure your automotive needs are met. In fact, our customers give us the highest ratings and reviews. Contact us for a quote when you need prompt auto repair services. We serve vehicle owners from Westerville, Columbus, Worthington, Gahanna, and New Albany, Ohio, as well as the surrounding areas.